The province is working to ensure all Albertans can benefit from the economic recovery by ensuring people with disabilities or low income Albertans have stable, predictable supports. Premier Notley and Minister Sabir announce details of proposed legislation that would help the province’s economic recovery reach vulnerable Albertans. If passed, An Act to Combat Poverty and Fight for Albertans with Disabilities would index social benefits like Assured Income for the Severely Handicapped (AISH) with inflation. It would also recognize increases to the cost of living by providing a one-time increase to AISH and Income Support. The legislation would mark the first increase to AISH benefits since 2012. In future years, benefit rates for financial assistance programs, including AISH, Learners Benefits and Barriers to Full Employment supports, would be connected to the Consumer Price Index. Nearly 250,000 Albertans receive support through AISH, Income Support or Seniors Benefits. 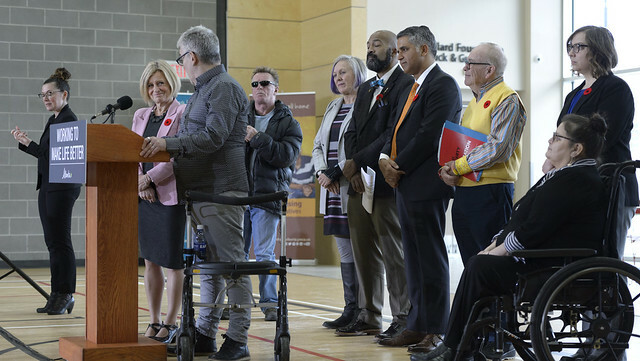 If passed, the legislation would make Alberta one of only four jurisdictions that indexes disability and income support benefits, and one of only two that indexes seniors benefits with inflation. To ensure Albertans with disabilities can plan for the future without eroding their savings, the legislation would also increase savings limits to match general eligibility criteria for the AISH child allowance ($100,000 instead of $3,000), and the AISH supplementary personal benefits from $3,000 to $5,000. The legislation comes after government’s ongoing discussions between the disability and poverty reduction communities. The legislation is a key component of Alberta’s Action on Poverty plan, which includes actions across government to make life more affordable, support wellness and social inclusion, enhance skills and employment opportunities and invest in affordable housing and homeless supports. If passed, the legislation would come into effect on Jan. 1, 2019. Quebec, Yukon and Manitoba index disability and income support benefit rates with inflation. Yukon is the only other Canadian jurisdiction that indexes their seniors’ benefits with inflation. If passed, the government will invest approximately $46 million in 2018-19 and $194 million in 2019-20 to support the legislation.